Should anything happen to Balimund, Asbjorn will take over the business and use phrases like "Here to purchase some armor or a weapon?" and "How can I help you today?" and bid you farewell with: "Thanks for your business." 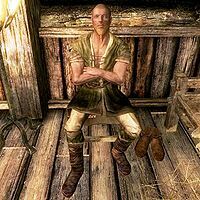 You can now tell him that he looks mighty young for a blacksmith and he will respond: "I was apprenticed to Balimund before he died. He taught me everything I know about forging armor and weapons. Balimund pulled me out of Grelod's orphanage when I was just a child. I don't know what he saw in me, but I was glad to get out of there. I've spent years watching his techniques and learning his tricks. Sadly, I don't think I'll ever be as talented as he was." This page was last modified on 12 April 2017, at 15:56.